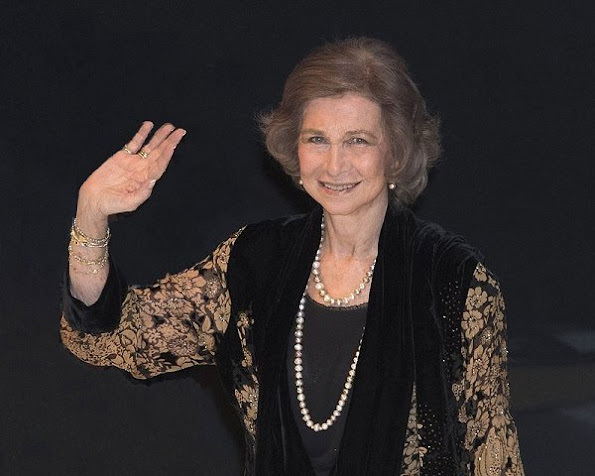 Queen Sofía (formerly Princess Sophia of Greece and Denmark was born on 2 November 1938, in Psychiko, Athens, Greece, the eldest child of Paul of Greece and his wife, Queen Frederica. Sofia is a member of the Schleswig-Holstein-Sonderburg-Glücksburg dynasty.) is the wife of King Juan Carlos I. Born a Greek and Danish princess, she became Queen consort of Spain upon her husband's accession in 1975. On 19 June 2014, Juan Carlos abdicated in favour of their son, Felipe. Happy 78th Birthday to Queen Sofia of Spain! Queen Sofia always look nice and is appropriately dressed for every occasion. Her daughter in law should look up to her. Su nuera no tiene 78 años. Sólo faltaría que se vistiera como ella. Letizia está haciendo su papel de forma extraordinaria, no tiene que imitar a nadie, son otros tiempos. SOFIA IS UNIQUE. SOFIA WAS BORN TO BE A QUEEN. SOFIA IS AN EXAMPLE OF WOMAN, WIFE, MOTHER AND GRAND MOTHER IN THE UNIVERSE OF THE MONARCHIES'. HAVING SAID THAT I ALWAYS WISH HER LONG HEALTHY LIFE TO LIVE LONG ENOUGH TO TEACH TO ALL OF US THE ROYALS AND WELL WISHERS A GOOD DOSE OF HER PATIENCE AND WISDOM.